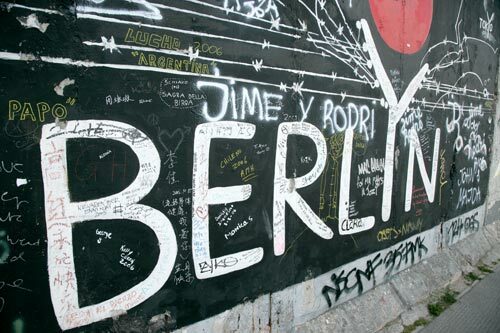 Mention ‘Berlin’ and the Fall of the Berlin Wall comes to mind for many people. The City of Berlin, with an area of 892 square kilometres, is nine times bigger than Paris. Berlin has around 1,700 bridges, easily beating even Venice. To date six US presidents have made historic speeches here since the war – most memorable being John F. Kennedy’s “Ich bin ein Berliner” (1963) and Ronald Reagan’s emphatic “Mr Gorbachev – tear this wall down!” (1987). With 175 museums, Berlin is said to have more museums than rainy days. The Berlin dialect was largely influenced by the Huguenots in the late 17th century. A few words of French origin are: “Budike” (pub or shop), “Boulette” (meatballs), “Roulade” (rolled meat slices) and “Destille” (pub). However other linguistic influences, e.g. Hebrew (via Yiddish) have left their audible mark in expressions like “Ganove” (crook) or “Macke” (quirk). There are over 180 kilometres of navigable waterways within the Berlin city limits. This makes it possible to explore Berlin by boat. For more Berlin Info, see HERE. Very interesting and helpful. Thank you. You spelled kilometers wrong you spelled it like this- kilometres. Otherwise thank you for the info. Thank you for your comment and I’m glad you found the information on this page of use. By the way, “kilometres” is the English spelling, whereas Americans spell it “kilometers”, so both spellings are fine depending on where you are. I really liked your compiled facts and I would really like to repost them on a blog I am working on with my colleague. We are going to Berlin and wanted to start up a Berlin blog for our students so they can check out different materials. May I have your permission and of course link it back to you. I am very new to the blogging world so I don’t want to do anything wrong. If you have any interesting tips about blogging, I would welcome them! Thank you for asking for permission to use material from our Berlin page to repost on your Berlin blog. Yes, you may use the material for your students, with a link back to Travelsignposts. – You’ve done the right thing by asking for permission and then linking back to the source of your material. Without the approval of the content owner, you could be reported to Google for ‘scrapping’ material, and your blog could be penalized. – If you are just gathering material for use by your students, it’s okay to repost material. However, if you intend becoming a successful blog that’s found in the search engines, then original content is required. With your trip to Berlin, you will no doubt have lots of original stories to tell. – Subscribe to blogging websites such as http://problogger.com/ or equivalent in your country and pick up tips from others. Good luck with your trip and happy blogging. Thanks a million. I travel to Berlin twice a year since 2003 but still need input from wise souls. Right now, it is a new world opening with blogging and trying to gather as much of information as possible. compare like with like! paris proper is the centre of a large urban area and you cannot compare it to greater London or the whole of berlin. when compared correctly paris is slightly bigger than London and much bigger than berlin.